On eve of US embassy move, Palestinian Authority calls on foreign powers to recognize eastern Jerusalem as PA capital city. 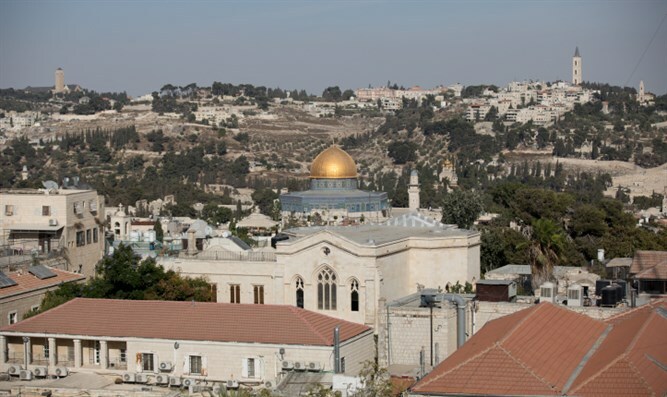 On the eve of the opening of the new US embassy in Jerusalem, the Palestinian Authority demanded Sunday that world leaders recognize the eastern portion of the city as the PA capital. The US is poised Monday to officially relocate its embassy from Tel Aviv to the Arnona neighborhood of Jerusalem, following President Donald Trump’s December 6th declaration recognizing Jerusalem as Israel’s capital. The Palestinian Authority, however, has urged foreign diplomats to boycott Monday’s embassy unveiling, and called on the international community to react to the US embassy move by recognizing eastern Jerusalem as the PA capital. PA spokesman Yousef al-Mahmoud called the US embassy move a violation of international law, the PA mouthpiece WAFA reported Sunday. “[This is] the most bizarre act undertaken by world leaders throughout history,” Mahmoud said of President Trump’s declaration on Jerusalem. Mahmoud called on foreign dignitaries not to attend Monday’s opening ceremony for the new US embassy, and said world leaders should ‘combat’ the US decision by declaring eastern Jerusalem the capital of Palestine.